I was hoping to get this game finished yesterday. I got as far as the final mission but after trying it about 5 times, it was starting to grate and I’d had enough. On the whole though, the game picked up a little in the second half. My wingmen actually started getting a few kills and there has been something resembling a storyline. 13 missions into the game, our carrier is attacked and destroyed while we are away on a mission and there is a cutscene where the captain stays behind on his own to ram the opposition ship taking them down with him. We get moved to join in with the Ronin squadron. This means a whole new set of animations for walking around a different ship which freshens things up a little. There is also a new launch procedure where we shoot out of a tube, rather than the being shoved out the bottom of the ship. The plot such as it is starts to move along with various squadrons on both sides being destroyed, one of my wingmen defecting, our sides leading pilot being captured only for us to later rescue him and various Coalition aces coming along for me to fight. The status of our squadron in this time goes from rookies to hero status. As our status improves and promotions come through I get more options of ships to fly. These have some character of their own but they are basically improvements of what came earlier. They come in light, medium and heavy varieties but they are all fighters and don’t feel massively different from each other. It may be better to have extra speed in some missions but you always want one of the newer craft and I’ve never had to go back and change my choice of ship at any time. The final 2 ships in the game are the most interesting to fly with one being a light fighter with cloaking ability adding new gameplay options. The other is a medium fighter which has a nova cannon. This cannon is basically a rail gun. You hold down fire while it builds up charge and then release to fire the stored energy in one burst. I don’t think it’s intended for use on fighters but it’s seriously effective used like this. It’s beam is instantaneous so I don’t have to aim ahead of a target and it takes out any fighter in one shot. This unbalances the game but it’s still fun and I only get to use it in the last few missions. The missions start to get a little lengthier in the second half of the game. This is both a plus and a negative depending on how many times I have to replay the mission to complete it. There is a mission where we fly captured enemy bombers to sneak up to the enemy flagship and torpedo it. I then have to return to my base ship, swap into a fighter and go out and intercept torpedoes before blowing up the attacking ships. There is a long slow flight at the start of this mission where I have to stay in formation while we get in position to fire the torpedoes. First time through this is fairly tense and atmospheric. By the third run, when I’ve been unable to protect my home ship from the 20 or so torpedoes that are already incoming by the time I relaunch, it’s getting tedious. I ended up sticking my headphones on and listening to a podcast while I was playing through it yet again. Starlancer is not entertaining at times like this. I remember having similar issues playing X-Wing Alliance where I was forced to sit through the same cutscenes over and over. That game did at least have a stronger plot than this but it does seem like the in-mission exposition is a detriment to these games unless you make the missions easy enough to complete within a couple of attempts. This is made worse but the fact that the mission designs frequently rely on you knowing what is coming up before you can complete it successfully. There are some very strict time limits involved where if you haven’t saved your missiles for that part of the mission or aren’t in the right region when the event is triggered you have no chance of completing the mission. It’s fairly poor design in all honesty and replaying the missions holds little appeal. 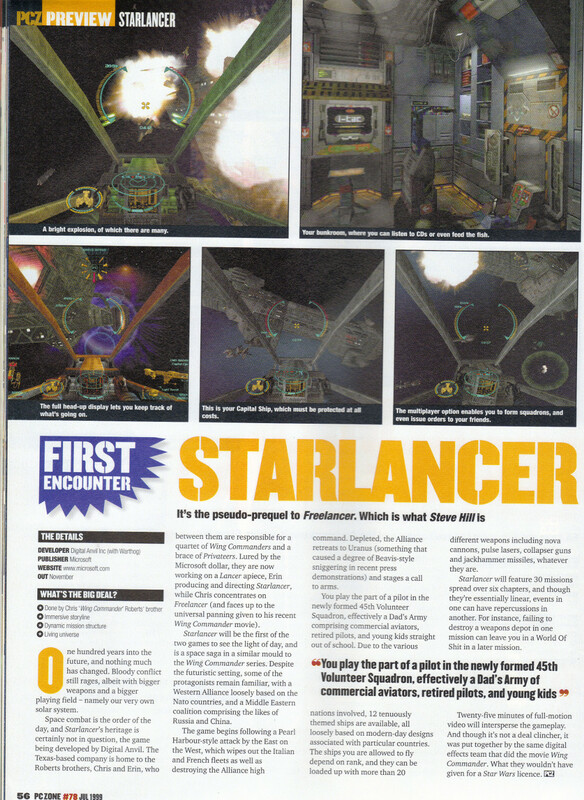 I could level this criticism at other space sims but Starlancer is more guilty than most. The final mission in the game is proving to be particularly annoying. It involves an attack on the Coalitions main base. This base is armed with an ion cannon which kills any ship that gets near it in one shot. This means I have to fly the only ship with a cloak, so that I can hide whenever I’m targeted. I have to clear the huge structure of turrets one at a time which is easy but after this, I need to protect a load of transports while they drop explosive charges onto it. Protecting these guys appears to be a matter of dumb luck. I managed it on my first attempt only to get too close when the base exploded later on. Since then I’ve not managed to protect enough of them and most of the squad always gets wiped out in a matter of seconds. I’ve got a good idea which ships I need to target now but this sort of required knowledge is very artificial and having to clear the turrets off this station over and over again has gotten old. Each attempt is taking 20 minutes with the critical part being over 15 minutes in. This is far too long if you ask me and hearing the same conversations over and over at the start of the mission rubs it in. If I knew of a cheat I could use, I would have resorted to it by now. I expect I’ll manage this mission after a few more attempts tonight anyway. If not, this might be the first game on this blog that I don’t finish. Playing this I can kind of see why we don’t get space sims any more as I’m not sure they had anywhere else to go. There are a lot of elements in this game that I’ve already seen elsewhere and it would be hard to do anything massively original. I still don’t think this is a particularly great example of the genre, despite having a myriad of earlier games to learn from. It’s competent but I’m sure that back in 2000 its main selling point was its graphics which aren’t going to impress anyone these days. I’ve still had a decent time playing this but I hope I can get this final mission done without any more failed attempts. It’s about time I played another game on here so I’ve gone back for another attempt at Starlancer. My last attempts at this were stopped by compatibility issues on new machines. Every time I thought I’d fixed it, it would crash somewhere else instead. Since then, I put together a Windows 98 PC for Longbow 2 and F-15 so in theory I shouldn’t have any problem running it on there. In practice, it still wouldn’t start until I got an exe with the copy protection removed but since then it’s 100% stable. I won’t go into the usual details about the since I’m retreading old ground and have already done it in previous posts. Instead, I’ll just give my impressions of it after playing half it’s 24 missions. First off the graphics are best described as reasonable. The most impressive effect is when a capship blows up and an explosion cascades along the length of the ship. The actual ship designs are nothing too interesting but everything moves quickly and very fluidly on a Voodoo 3. I’m sure these graphics were good at the time but I think Prophecy has held up better as the alien ships had far more character. The cutscenes are few and far between but the ships and environments look way above average when you do get one. I can believe they were done by the same people as the movie fx. The animation of the CGI characters is far less impressive though and they aren’t going to fool anyone for a minute. The 2 cutscenes that I’ve had were newscasts primarily showing events that had already happened so they don’t further the plot at all. I’ve played half of the games missions so far and in all honesty there hasn’t been much plot. Events occur on the missions themselves but this is no Wing Commander with a story between the missions and characters you can get to care about. There is an audio news broadcast after every mission but it’s a little dull and the storyline of Starlancer is by far its weakest point. 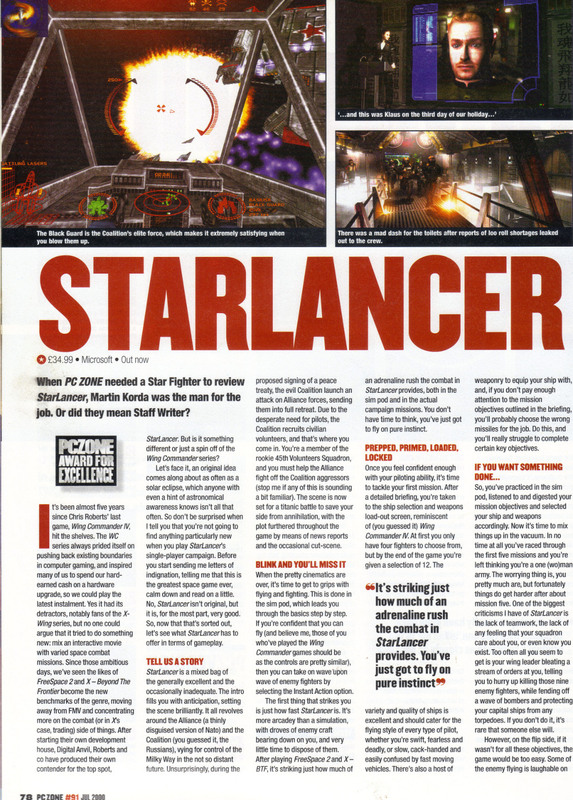 I’d consider it a step backwards from the original Wing Commander, never mind the likes of Wing Commander 4 or Privateer 2. I’ve played half the game and about all I can say is that our forces have regrouped and we have now started attacking having developed our own warp technology. There are minor sidestorys about someone defecting from one of the squadrons I flew with earlier and apparently some Admiral I’ve never heard of looks like he will be voted President but it’s all fairly weak and I can’t imagine anyone caring about Starlancer’s story. This game is all about the missions themselves. Thankfully the missions and the gameplay itself are a lot better. The missions are long and varied with loads of in-flight communications, different characters to meet and fly with and changing objectives as situations develop. In one of the most interesting missions early on we discover that the Coalition has developed a warp gate technology and a couple of us get sucked through this gate all the way to Neptune. I then have to blast armor off the gate, before blowing up it’s core and afterburning back through before it blows up. Whatever the briefing says, you are never sure what you are going to face on any mission. Another mission that deserves a mention involves attacking a fuel depot made from a giant asteroid. In this after clearing the turrets off the outside of the base, I have to blast the doors open, then fly inside and take out the interior turrets. I can’t think of many space sims where I’ve flown inside a structure before this. There are certainly some large bases in this game although possibly not on the scale of Tachyon – The Fringe which came out around this time. 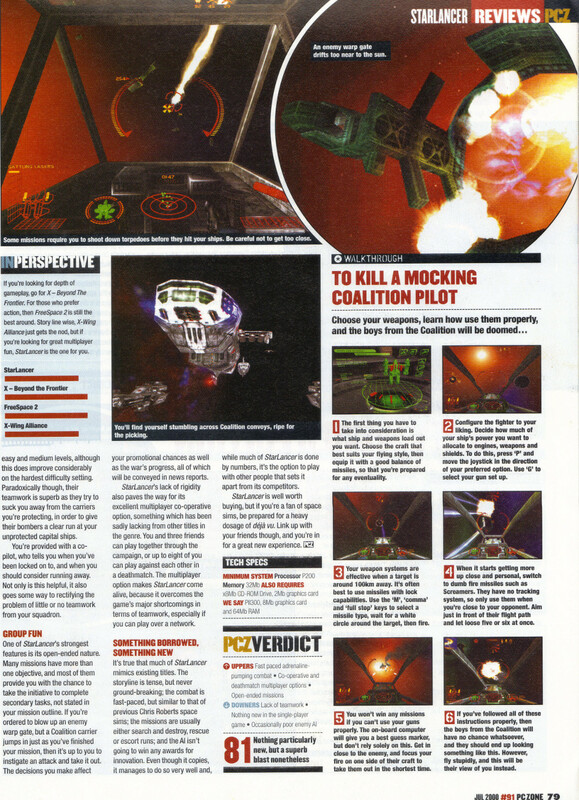 Attacking capships is a case of blowing off the important bits one by one similar to Wing Commander Prophecy. Anyone who has played Prophecy will certainly feel at home playing this, although it possibly bears more similarity to Privateer 2 in terms of flight dynamics. The difficulty level has been fairly well judged and I found the initial missions too easy but it’s been a reasonable challenge since then without becoming difficult. The long missions with the large amount of unskippable conversation would not be something I’d want to play through too many times. It would quickly become irritating if a mission required more than 2 or 3 attempts but I’ve done the vast majority on the first go. My impressions so far are that the missions are decent but the game is badly lacking atmosphere. I definitely don’t feel like I’m part of a fighter wing and it seems to be a case of a fighting the Coalition on my own. I must be getting 90% of the kills on every mission despite often flying with over half a dozen other fighters. I do fly with the same wingmen each time but I’m not aware of them having any character of any sort. The enemy ships similarly all feel the same to fly against and I couldn’t tell you any particular characteristics of near enough any of them, except for the torpedo bombers who are conspicuous since their appearance means loads of flying around intercepting missiles. The A.I. of the enemy isn’t great which is just as well given how many of them I have to deal with on my own. Halfway through this game I’m underwhelmed. It’s not bad but I can think of a stack of space sims that I prefer.